Recently our community learned that the Government of Canada, through an Order-in-Council (OiC) decision has approved a replacement span for the Ambassador Bridge. The announcement was disseminated through a departmental press release and included several ‘Terms and Conditions’ that the Canadian Transit Company (the company that owns and operates the Ambassador Bridge) must respect as it proceeds with their replacement span project. The timing of the government’s decision, as well as some of the key aspects of the OiC ‘Terms and Conditions’ raised several questions from residents and stakeholder groups across the region. To further the community’s understanding of the decision and to identify key concerns, I chose to organize a public meeting. At the public meeting I sought to bring together stakeholders from across the community to help to provide answers and listen to residents. I was joined by my Federal Caucus colleagues MPs Cheryl Hardcastle (Windsor Tecumseh) and Tracey Ramsey (Essex) as well as MPP Lisa Gretzky (Windsor West). Our panel also included Matt Marchand – President and CEO of the Windsor-Essex Regional Chamber of Commerce and Brian Hogan President of the Windsor District Labour Council. In addition the City of Windsor was represented in the audience by the Mayor’s Chief of Staff-Norma Coleman. The meeting featured a short power point presentation that put together a number of different facts connected to the Ambassador Bridge Replacement project, attendees were also provided with the Government’s Order-in-Council approval document including the ‘Terms and Conditions.’ The presentation – linked here below – is by no means exhaustive but summarizes many different aspects of this decision. The panel took written questions from the meeting attendees. Time did not permit a full examination of every question submitted. However, I have posted them here and will endeavour as we move forward to answer them either directly or by bringing them forward to the Minister. A point that re-iterated throughout the meeting was the importance of ensuring that we continue to be vigilant as a community with respect to our border. This includes ensuring that community impacts are mitigated with respect to the Ambassador Bridge Replacement span project but also continuing to ensure that the Gordie Howe International Bridge project proceeds. As a long-time resident of the affected area, I would like to know who is going to compensate me for the loss in value of my home? Or buy me out because I no longer want to live in the shadow of the proposed customs plaza? What will happen to the properties owned by the CTC which are now boarded up? CTC needs to be held accountable to the community! What is the process for expropriation for properties directly adjacent to the footprint? What is the willingness for the CTC to engage in a community benefit process? How involved will the community be in establishing Community Benefits, prioritize said benefits and ensure benefits are enacted? How can we ensure infrastructure costs for the purchase/ maintenance of roads etc. are not downloaded on to the taxpayers of Windsor? Are there ways to mitigate construction delays in the Sandwich Towne & West end communities? How will you ensure the transparency of this situation is clear? The Privy Council decision was made to CBSA June 2016 and approved July 2016. Why was such an important decision kept from the community that will suffer the consequences of the decision?What happens to the Chateau Park LTC home? Do they stay? No monetary value can be put on our home! Can we ask for the cash value we feel is fair or can the bridge expropriate us and when would this take place? The original intent was to minimalize idling and traffic along the corridor 13 stop light or so at that time. Will the Gordie Howe way enforce trucks through the corridor? Otherwise it leaves approximately 8 traffic lights to the Ambassador Bridge of idling, traffic and intercity delays. Are there any pending lawsuits that the CTC has in place to stop construction on the Gordie Howe Span, if so are they prepared to drop legal action now that they have received approvals to proceed? What sanctions will the CTC face if Bridge is not demolished within the 5 years of the new bridge opening? What will happen to the properties owned by the CTC which are now boarded up and left to decay but are not in the footprint? Given the CTCs history of running down the present bridge and flagrant disregard of both federal government’s & provincial legislation, how can the federal government trust the promises implicit in the Order in Council? Contempt of court orders etc. What stops will the government take to ensure compliance with the conditions specified in the Order in Council? Now that they are building a replacement span, why spend all of the money on the Gordie Howe Bridge? How is this keeping trucks off Huron Church? Can the City of Windsor restrict in any way truck traffic on Huron Church Rd. once the Gordie Howe Bridge is completed? What is going to happen to the blight on Indian Road? And what further blight will this cause around the new bridge base in the Sandwich Towne & University areas? What happens to the Chateau Park Long Term Care Home and to the seniors & disabled individuals residing there? Do they stay and endure the filth and noise? Do they move from a safe, secure, comfortable home because of Mr. Maroun? I have read nothing in the Government of Canada’s Order pertaining to the labour force, specifically contracts for local workers and building materials. What guarantee do we have that Windsor/ Essex County will benefit from this construction project? Statement: Keeping in mind any environmental assessments forthcoming and new legislation requiring staging and inspection plaza at new crossing. Question: Is there any way that the current staging plaza (In an Industrial area) could be continued where it is? Any study planned on the effect of the construction/ demolition of the bridges on Assumption Church? Why was the bridge CEO fired? Why did they say they didn’t want proposals from the 3 prospective builders for another year? Is money becoming an issue in gov’t making decisions? If there was a change of government at the next election, is the new government bound to complete previous order of council assuming construction has not proceeded yet? Can the decision be reversed? What if any U.S. regulatory issues remain that could potentially block the building of the new bridge? What stops the current bridge owner from undercutting toll making the new bridge underutilized? There have been dozens and years of public meetings regarding the Herb Gray Parkway and the Gordie Howe Bridge? Will the private firm CTC be required to have public meetings as well? Where does Dwight Duncan fit into this picture and what authority does he have? Can the bidding process be changed again? Dwight Duncan has stated Canada had little choice and could not use the excuse they didn’t like the owner of the Ambassador Bridge”. This is not about liking or disliking the Bridge Company, but wheter they have a history of compliance, cooperation and good will with the rule of law, and with their neigbours. They don’t. In your opinion, did Canada have a choice in this matter? Given the planning that went into the Gordie Howe Bridge resulting in 6 lanes being enough, what has changed to require another bridge with 6 lanes. It doesn’t make sense to incur double the cost if only one 6 lane bridge would be enough? Why didn’t the feds put a “no more injunction lawsuits to stop the Howe bridge” as a condition for approval to Moron’s new bridge? What avenues/options does the Feds have if Moron doesn’t tear down the old bridge? We all know how he loves playing the “use the courts to delay” game. What types of decisions are typical for Order in Councils? Are they subject to questioning in Parliament? Will this decision be questioned by the NDP in Parliament? Was it possible for the council to add a condition that the CTC drop all court cases against the new Gordie Howe Bridge? The new span is subject to conditions Are there decision making points where his span can be stopped? What types of decisions are typical for order in councils? Are they subject to questioning in Parliament? What is the entire footprint of this plaza? There is a No impact Clause in Law, which would include Assumption Church. Where are the Ministry of Transportation’s seismic tests as promised regarding our Heritage building? How is it possible in this day of terrorism that we as a country think it was a good idea to give a private entity renewal of an international border crossing? Especially one who seems more of a “slum lord” as you can see by how well he has maintained the current Ambassador Bridge over these years. How was the permission to build the 6 lane bridge given to Matty Maroun without consulting the Windsor public and residents about addressing issues? What guarantee will Windsor benefit from this labour project? Note: Gordie Howe project $250million allocated for Windsor/Detroit construction team. I have read that Mr. Maroun owns several properties in the Del Ray community. What will keep Mr. Maroun and possibly the CTC from preventing the Gordie Howe Bridge from getting built, especially now that the federal government has given the green light for the CTC bridge? Given the Bridge running down the bridge, how can the government trust the Bridge’s promises implicit in the O.I.C? Why was the tender closing date suddenly moved to a date later than the bridge approval date? Keeping in mind any environmental assessments, forthcoming and new legislation requiring staging & inspection plaza at the new crossing? Is there any way that the current staging plaza (in an Industrial) could be con’t where it is? It’s fully known that the Archeology in the past was denied by the executives of the Ambassador Bridge Co. They’ve illegally removed top soil and brought stone crushers on their property. I provided picture to “Transport”. The very idea of the Gordie Howe Bridge is to take traffic from Huron Chruch due to citizens concerns. Now new bridge with 30% increased capacity the purpose fails. Secondly US has designated the Ambassador Bridge as a heritage site, so after constructing the new bridge if they didn’t bring it down in 5 years are we stuck with both new & old as well as the Gordie Howe? What is to become of the cemetery located next to the current bridge plaza? What measures will be in place to protect Assumption Church against damage from excessive vibration during construction and demolition. I operate vibration-sensitive equipment at GLIER, which will be directly next to the new span. The vibration from construction and subsequent bridge traffic will likely impact the equipment which relies on user fees. Will the Federal Government/ Bridge Company provide compensation or Vibration mitigation protocols? How will the various levels of government presently involved be able to keep the Bridge Company in check when it cannot hold it presently accountable under the law for its actions because it continues to use the laws & courts to thwart the community in which it operates? It holds itself as a good corporate citizen but has made a shamble out of the west end. I live just one block west of Indian Rd on Rosedale the noise level from the bridge has increased and sometimes my deck at the back of the house shakes because of traffic. How will my quality of life be protected and maintained, let alone improved. Also the uncertainty of the project has decreased the value of my property. How will I be protected from this in the future? Since the new span of the bridge will be built on a known Huron-Wyandotte Reserve, and archeological sites have been identified. Will the bridge company have an independent archeologist and Huron-Wyandotte Monitor on site during construction? Over a dozen times over the last month or so, there have been extremely loud repairs on the bridge in the hours after midnight. The City of Windsor states that they have no jurisdiction over the bridge for noise. After days of phone calls, I found out it’s under the control of Transport Canada. Transport Canada’s messaging service is full. What kind of overseeing is there for a construction project this large located right next to a residential area. With construction starting, all these should be provided by the funds from the construction and after the construction too. They should be maintained by the funding from the bridges. Greenspace, trees, parks etc. What plan is there to keep and maintain them? Why was Matty Maroun allowed to purchase homes on Indian Rd and allow them to become dilapidated without the City of Windsor enforcing property standards? There are still people living in the area who have to stare at these horrible boarded up buildings. If we owned these buildings and did not look after them, the city would take action against us? There should be compensation for Property Owners whose value has dropped because of adjacent bridge. CTC – Will it allow access under the bridge to connect the present system to Sandwich Towne. Should provide a detailed site plan and make available publically via Windsor Star. How many more homes will be demolished by the new bridge? What happens to Assumption Church when all of the demolition & noise vibration occurs? Will we lose the church as well? Who will be held responsible for our heritage? How do they deal with controlling environmental pollution due to projected 35% increase in traffic on this new bridge right next to the old bridge. In making the decision to build this new Ambassador Bridge privately owned, did the Order in Council decide there was no need for two bridges to eventually serve all the border crossing between Canada and the United States? Given that the CTC has demonstrated history that has distinctly disregarded federal, US and International laws, how will the Privy Council of Canada and the Minister of Transportation ensure measures for compliance, accountability and transparency to our community. What if any security (performance) $ deposits are in place to ensure the Ambassador Bridge Company stays on track with regards to timelines, safety, environment, commitments short & long term. Past behaviour indicates that they proceed with work and then ask for forgiveness afterwards without the necessary permits/ approvals, (I-75) connection/ plaza. With regard to the new Fire Station on Daytona – Will this be a replacement of the current one on College Ave? Community Input on Plaza Design Changes? Will replacement bridge require Bike/ Pedestrian lane? 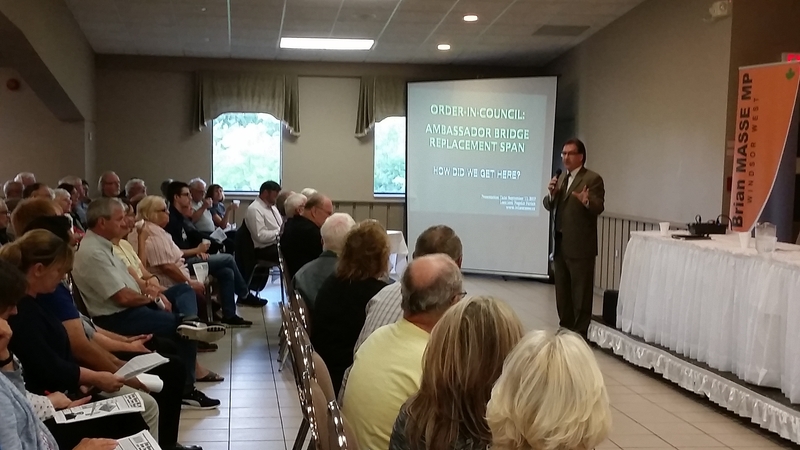 Will Huron Line improvements paid by Bridge? Why is the Ambassador Bridge owner able to hold the Canadian and US Economy back? One Millionaire should not be able to do this. The Bridge Company has thumbed their nose at the City of Windsor/ Detroit, Ontario/ Michigan, Canada/ United States. Filed numerous frivolous law suits and shown contempt for residents that live in the neighbourhood near the bridge in both Windsor & Detroit. Now they are being rewarded with a permit to continue the monopoly they have enjoyed. Why? How can we stop this? Will there be a pre-clearance facility with this bridge and has this already been approved before the relevant legislation is passed (C-23)? How should we oppose the placement of the U.S. Agents enforcing U.C. racist laws in Canada? Can you hold monthly town halls on this issue to be kept informed? Does the ABC pay property tax of the ramp land, as we know it pays taxes for the plaza? Will the demolished homes/ properties along Indian Rd. etc become property tax free as well? What will happen to the boarder up houses along Edison, Detroit and other Sandwich areas. Is it conceivable that the revitalization of the Ambassador Bridge and the cancellation of the East-West Pipeline is part of Canada’s attempt to preserve NAFTA? I can assume that Matty Moroun is on a first name basis with President Donald Trump. We originally thought the main concerns of a new crossing were to reduce traffic and pollution along the Huron Church corridor. Now we can expect more of both! What about the money Canada agreed to help the US pay for their side of the Gordie Howe Bridge? Now that the Bridge is not moving ahead, what happens to our “investment” so to speak? In terms of holding the community “hostage” as tolls for the Ambassador Bridge continue to escalate, let me remind you that Windsor-Detroit Tunnel tolls also continue to rise, thereby also holding us hostage to these rates…comment?